Used by professional grounds keepers across the country. Constructed from natural cocoa fibers that "float" across the surface producing a beautiful finish with minimal buildup of your infield mix. Features solid-steel twin blade cutting edge to level rough spots. 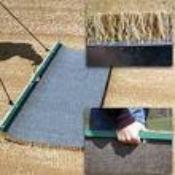 Also great on turf to break up core aeration plugs and smooth in top-dressing mateials. Features a handle grip for easy transport.